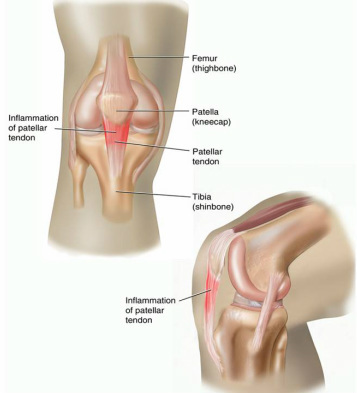 Patellar tendinopathy refers to inflammation within the tendon which lies just beneath the patella (kneecap). results from overuse of the patellar tendon. The function of the patellar tendon is to transmit forces produced by the thigh muscles (quadriceps) to the shin bone (tibia) to produce movement of the knee joint. Repetitive use of the quadriceps muscle and consequently the patellar tendon can lead to microscopic tears within the tendon. Gradual degeneration of the tendon may occur as a result. Pain will be felt below the kneecap and aggravated by activities such as jumping, hopping and leaping. Factors which may contribute to patellar tendinopathy include a recent change in training (including frequency, duration, intensity, training surfaces), reduced rest times, biomechanical abnormalities and decreased muscle flexibility. In the early stages, the pain during exercise may initially disappear as you warm up, only to return when cooling down. Associated with the pain may be stiffness or tightness in region of the kneecap. Usually these initial signs of patellar tendinopathy are ignored as they disappear fast with walking or applying heat over the kneecap region. However, as exercise is continued the tendinopathy gets worse and the pain begins to be present for longer periods during exercise until it is present all of the time. This may interfere with performance.